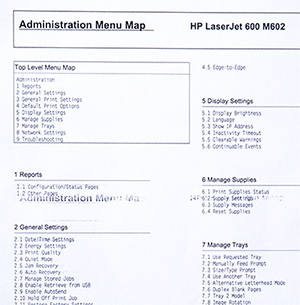 To ensure proper fusing on a broad range of media, most HP laser printers allow fuser temperature adjustment. For example, a user printing on letterhead could change the default Print Mode for Letterhead from normal mode to light mode if the paper was getting crumpled from excess heat, or to heavy mode if the toner didn't fuse properly. A recent firmware update for the M601/M602/M603 has a problem. 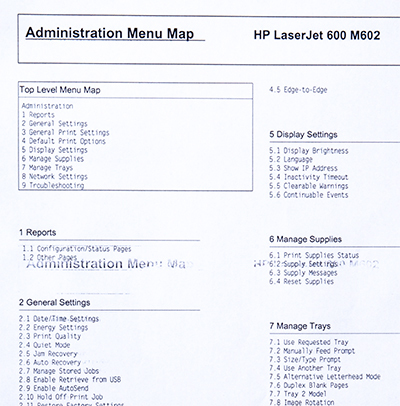 This revision sets the default Print Mode for plain paper to Light instead of Normal, and the resulting lack of heat can result in fusing issues, namely, smeared toner and the repetition of the image down the page (ghosting). Changing the print mode to normal mode (or to heavy mode if problems persist) is the solution. The instructions for this task are at the end of this article. First we will look at Print Mode and other modes. Traditionally, color printers offered more modes than the monochrome. Monochrome printers introduced before 2011 limited the modes to LOW, NORMAL, and HIGH. Since 2011, the color and black and white printers both offer many options. Here is what the M601 series offers. Note that the available modes may differ slightly for different printers, different firmware revisions, and different paper types.